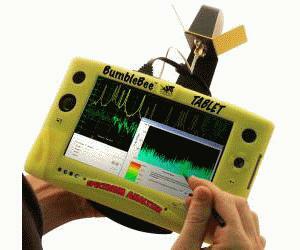 BumbleBee™-TABLET is a Windows XP® tablet UMPC spectrum analyzer all-in-one system. The calibrated receiver measures a combo of popular wireless bands including Wi-Fi, Wi-MAX, ISM, Public Safety, Bluetooth and more. The BumbleBee™-TABLET interface offers a large 7" WVGA LCD touch-screen featuring Intel Pentium® processor. In addition, the tablet UMPC has an internal 40GB HDD for instant storage and playback of all captured RF spectral network installation, coverage and interference analysis data in the field. Advanced spectrum analysis features include user selectable power triggers, 3 pairs of markers, spectrogram, histogram, video smoothing, waveform averaging, 1 live trace and up to 4 peak hold waveform traces with peak hold & peak search. BumbleBee™-TABLET takes the power of sophisticated laboratory spectrum analyzers and delivers it to installers in the field and engineers in the lab.